The celebrations get bigger on Vaisakhi (Baisakhi) in London at City Hall. Know more on Vaisakhi celebrations in London, 2019. 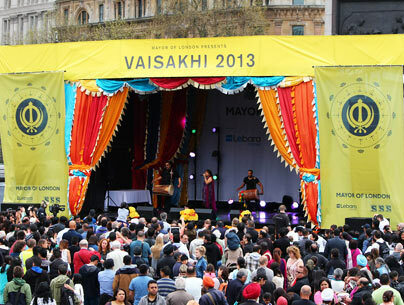 Vaisakhi in London - Vaisakhi is celebrated at City Hall (London) with great fun, music, dance and cultural activities. London celebrates Vaisakhi (Sikh New Year festival) in a unique style that helps brining people close to their Punjabi traditions and culture. The event involves indoor and outdoor activities for anybody who wishes to attend Sikh cultural celebrations. The event has become quite popular among people of United Kingdom. In the last few years, this cultural event has witnessed around 20,000 people in the city of London. Vaisakhi is one of the auspicious Sikh festivals with celebrations of Sikh tradition, heritage and culture. 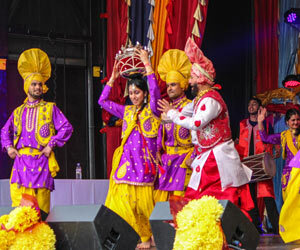 London welcomes Sikh New Year in colorful celebrations with music, dance and traditional folk songs. The event promises to be a memorable experience as the programme includes shabad kirtan (spiritual music), langar (food), turban tying, and much more! You will also get a chance to see Sikh folk dance, and martial arts (gatka) performances. A large number of Volunteers will be there to help visitors. So come along and visit City Hall in London on April 9th to celebrate Vaisakhi with your near and dear ones. A range of fun activities are lined up for your kids at this event. There will be small competition for kids to test their knowledge and skills. Cultural based activities for the kids like turban tying, and quiz. It’s a great chance to explore Sikh history and culture as this event will be attended by Sikh community members in United Kingdom. This event is jointly organized by mayor of London and Sikh Sabha, London East. So get yourself ready for this mega celebration of Vaisakhi in City Hall, London.